Reception Hall: 9’9” x 7’2” Landing. Random-width oak plank flooring. Two coat closets. Turned staircase. Entrance to living room and dining room. Arched entry to center hallway leading to kitchen. Center hallway to kitchen has small storage closet below staircase and sconce. Living Room: 21’2” x 13’ Random-width oak plank flooring. Crown mouldings. Arched brick fireplace with brick hearth and surround. Storage closet. Built-in lighted book shelving with glass and wood shelving and storage below. Storage below front windows. Plantation shutters. Housing for surround sound speakers (no speakers in housing). Recessed lighting. Dining Room: 14’4” x 12’9” Random-width oak plank flooring. 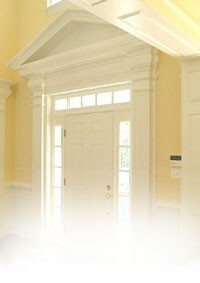 Picture mouldings. Chair rail. Two corner china closets with lighted glass shelving and storage below. Chandelier and sconces. Plantation shutters. Recessed lighting. Surround sound speakers. Kitchen: 18’8” x 9’4” Oak flooring. Quartz countertops with subway tile backsplash. Jenn-Air gas range with convection oven. Sub-Zero refrigerator/freezer. Bosch dishwasher. Jenn-Air trash compactor. KitchenAid built-in microwave. Kohler enamel double sink with Insinkerator disposal. Heart pine custom cabinetry and crown mouldings. Under-cabinet lights and plug-moulding. Walk-in pantry with 2 glass-front wall cabinets. Breakfast bar. Recessed lighting. Housing for surround sound speakers (no speakers in housing). Entrance to family room. Beadboard ceiling. Rear staircase to second level with sconce. Access to lower level staircase with sconce, rear hall closet and garage. Family Room: 23’1” x 17’1” Oak flooring with Brazilian cherry inlay. Tray ceiling with crown mouldings. Masonry fireplace with granite hearth and surround. Built-in glass-front cabinet with lighting and cabinetry below. Built-in entertainment cabinet with storage below. Windows with transoms on two sides. Exterior door to patio. Recessed lighting. Surround sound. Please note: Seller is willing to leave the mounted flat-screen television, receiver, speaker and sub-woofer which create the sound system, if Buyer would like to retain them. Half Bath: Oak flooring. Pedestal sink. Sconces. Recessed lighting. Sunroom: 13’4” x 10’ Accessed from living room. Brick flooring. Crown mouldings. Windows on three sides. Surround sound speakers. Exterior door to patio. Ceiling fan. Sconces. Lovely views of side yard. Hallway: Oak flooring. Double-door laundry closet with tile floor and walls and Bosch front load washer and dryer, which shall be conveyed with property. Double-door linen closet. Window seat with cedar lined storage. Recessed lighting. Plantation shutters. Entry Hallway: Oak flooring. Sconce and recessed lighting. Two walk-in custom closets. Pull-down attic access. Bedroom: 17’1” x 14’7” Oak flooring. Fireplace with marble hearth and surround. Gas logs. Vaulted ceiling with fan and indirect lighting. Surround sound speakers. Plantation shutters. Master Bath: En suite. Marble flooring. Marble walk-in shower with frameless glass door and side panels. Please note: Shower jets do not work and shall be conveyed “as is”. Jetted tub with marble surround. Double vanities with glass shelving, drawers and storage below. Private water closet. Palladian window. Chandelier and recessed lighting. Plantation shutters. Bedroom #2: 17’5” x 11’1” Oak flooring. Two closets with custom shelving. Window seats with cedar lined storage. Plantation shutters. Sconce. Under-eaves storage. Full Bath: En suite. Ceramic flooring and surround. Tub/shower with ceramic surround. Vanity with cabinet below. Bedroom #3: 15’4” x 11’1” Oak flooring. Closet with custom shelving. Plantation shutters. Sconce. Surround sound speakers. Full Bath: En suite. Marble flooring and ceramic surround. Tub/shower with ceramic surround. Pedestal sink. Plantation shutters. Bedroom #4: 11’1” x 9’9” Rift pine flooring. Hallway entrance area with recessed lighting, under-eave storage, and access to rear staircase. Full Bath: En suite. Rift pine flooring. Tub. Pedestal sink. Built-in medicine cabinet. Recessed lighting. Recreation or Exercise Room: 22’3” x 14’7” Recessed lighting. Closet. Crawl space access. Housing for surround sound speakers (no speakers currently). Studio/Study or Playroom: 22’2” x 15’3” Fireplace with brick hearth and surround. Gas logs. Built-in book shelving with cabinet below. Built-in shelving with desk. Built-in niche above fireplace. Exterior French door to rear gardens. Recessed lighting. Excellent natural light and windows. Access to workshop. Half Bath: Ceramic flooring. Sink. Sconces. Workshop/Storage Room: 21’ x 7’7” Heated and cooled. Please note: This room is not included in finished square footage. 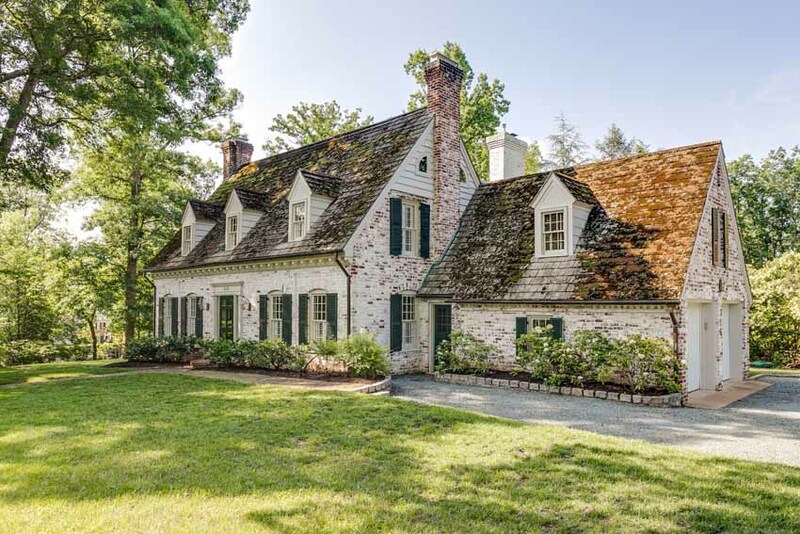 One of the loveliest and earliest homes in Windsor Farms! Square Footage: 4006 square feet per appraiser, which includes 869 finished square feet in the lower level (but does not include the heated and cooled workshop). Prospective purchasers and/or their agents should confirm data.